If Viswanathan Anand topples Veselin Topalov, then it will be an against-the-odds victory for the maestro. When Anand isn't working his way through obscure opening variations, he is often found squinting through telescopes at obscure astronomical objects. His first reaction to Eyjafjallajokull was mild anxiety about the effect on visibility. When the ash-cloud left him stranded in Frankfurt, en route to the world title match in Sofia, the concerns ceased to be mild. Anand arrived four days late after a 40-hour drive with his eight-member team. He managed to watch the first two parts of Peter Jackson's The Lord of The Rings on the epic journey. 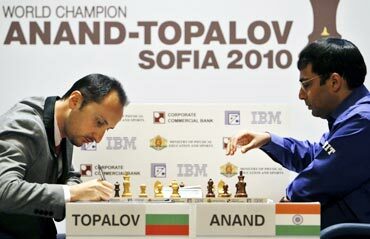 His request for a three-day postponement was refused by the Bulgarian Chess Federation (BCF) in a letter, which seemed to suggest the volcanic eruption was Anand's fault. In mitigation, the BCF had a sudden cash crunch (apparently now solved). But it could have couched refusal more diplomatically. 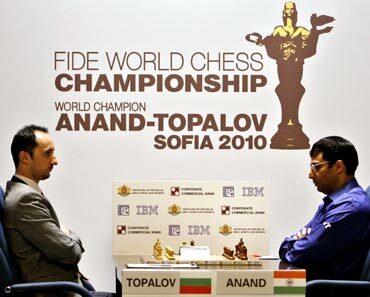 The match might have ended before it started but for the tact of Anand's wife-manager Aruna, and the intervention of Bulgarian prime minister Boyko Borisov and FIDE to order a one day postponement. Anand was not in an ideal frame of mind in Game 1 and that resulted in an amateurish error. He remembered that he must play two specific moves but he reversed the order. The position (a Grunfeld Defence) was on a tightrope. Topalov crashed through to create a masterpiece. Showing great character, Anand clawed back Game 2. This was a prime example of psychological warfare. He played a new move in the Catalan Opening, exchanging queens while a pawn down. Kibitzers as eminent as Garry Kasparov and Nigel Short condemned it. Topalov must also have thought it bad and lost his sense of danger. The challenger self-destructed in a position turning sour for him. Anand said he thought he was okay until he suddenly realised he was winning. Game 3, Anand defended an inferior but solid position to draw. The play was nothing special accurate defence in a Slav (Czech Variation). But Topalov has vowed to neither offer nor accept draws. The position was repeated thrice (a forced draw). He called the arbiter to ratify it rather than sign a peace treaty. In the kerfuffle of calling arbiters, the players omitted to shake hands. When the inevitable questions came up at the press conference, Topalov said "Oh no! We forgot" while Anand responded "Don't worry, next time, we'll shake hands via arbiter." Score: 1.5:1.5 with nine games to go. Game 4 was another Catalan. By move 20, Anand had a big edge and Topalov weakened his king-side. The next 12 move saw a spectacular sacrificial assault. Score 2.5:1.5 for Anand, who played one of his best games ever. Game 5 saw another calm defence by Anand in another Czech Slav. The lights failed in the Military Club auditorium when the Sofia grid collapsed. Anand kept his cool. This time, they remembered to shake hands. At the time of writing, Anand leads 3-2 with seven to play. All three decisions have gone in white's favour. With two whites in succession (the sequence switches after Game 6), he must exploit that (you'll know about Game 6) to increase the lead. He is now favourite to retain the title he grabbed in 2007, and with it, the lion's share of Euro 2 million. Some of the latter and much credit for the former will go to his seconds, GMs Peter Hiene Nielsen, Rustam Kasimdzhanov, Surya Ganguly and Eric Van Reem, a computer expert. Arrayed against them, Team Topalov includes GMs Ivan Cheparinov, Jan Smeets and Erwin L'ami, as well as Jiri Dufek, who is writing the opening "book" for the chess engine, Rybka. The computer expert tells you how seriously the prep is taken. Unlike Bonn in 2008 (versus Vladimir Kramnik), Sofia is hostile territory. Further volcanic eruptions from partisan organisers rooting for their "Vesya" is a possibility. Plus, Topalov is known for his come-from-behind spirit. If Anand does pull it off, the third part of the Lord of the Rings trilogy (The Return of the King) will make appropriate watching on the way back. Diagram 1: White to Play, Topalov Vs Anand, Game 1, Sofia 2010. Black has played 23.--Kf7? Topalov responded 24. Nxf6!! Kxf6 25. Rh3 (Also 24. - Qxf6 25. Rh3 works) Rg8 26. Rh6+ Kf7 27. Rh7+ Ke8 (27.--Rg7 28. Rxg7 Kxg7 29. Qxg5+ or 28.- Qxg7 29. Rc7+) 28. Rc1c7 Kd8 29. Bb5! Qxe4 (29. -Qxb5 30. Qxd4+ mates) 30. Rxc8+ (1-0). If 30.--Kxc8 31. Qc1+ wins or else 30. - Rxc8 31. Rd7+. A beautifully calculated attack. Diagram 2: White to Play Anand Vs Topalov, Game 4, Sofia 2010. Black's pieces are stuck on the queen-side. Hence 23.Nxh6+!! gxh6 24.Qxh6 f6 25.e5! The second sac seals it. Black's best is the prosaic loss 25. - Qg7 26. Qxg7 Kxg7 27. Bxc6. Instead Topalov tried 25- Bxg2 26.exf6 Rxd6 27.Rxd6 Be4 - the threat is mate via Rc4-h4. 28.Rxe6 Nd3 A one-move threat (Qxf2#) 29.Rc2 Qh7 30.f7+ Qxf7 31.Rxe4 Qf5 32.Re7 (1-0). Mate is on after 32.-Rf7 33. Rc8+ Qxc8 34. Qg6+ or 32.-- Qf7 33. Rxf7. A fabulously creative assault. 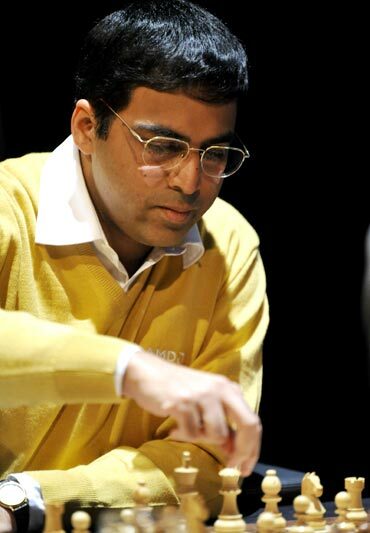 Vishy Anand turns 40. Wish him!